1. RAFFLE GRAND PRIZE: Winner’s choice of 2018 Chevrolet Cruze (MSRP $20,400) or 2018 Chevrolet Trax (MSRP $21,995 and depending on inventory at the sole discretion of the WCSFF, this could be a 2019 model) will be awarded on Sunday, October 28, 2018 at the Western Carolina State Fair held at the Aiken County Fairgrounds at 4:00 pm to the person holding the winning raffle ticket as long as that person is at least 18 years of age on October 28, 2018 and is present at the Fair at the time of the drawing and presents the winning ticket upon that ticket being called. 2. For a raffle prize that is a motor vehicle, the winner may apply the cash equivalent of the prize won towards the purchase of an alternative vehicle of the same or higher fair market value from the same automobile dealer retailer from where the grand prize comes. Under no circumstances may the winner opt for a cash award in lieu of taking possession of the grand prize motor vehicle. The winner is responsible for any and all costs beyond the cash equivalent of the prize, including all other costs, expenses, fees and taxes. 3. The Western Carolina State Fair Foundation (WCSFF) is registered with the South Carolina Secretary of State’s office and has filed the required forms with the Secretary of State to conduct this raffle. 4. The Western Carolina State Fair (WCSF) is held at the Aiken County Fairgrounds located at 561 May Royal Drive, Aiken, South Carolina 29801. 1. No directors, officers, or employees of the WCSFF or their immediate family can win the raffle prize. No persons associated with Reithoffer shows, vendors at the Western Carolina State Fair or their immediate family can win the raffle prize. “Immediate Family” is defined herein as wife, husband, mother, father, child (not grandchild), brother, or sister. 2. The winning raffle ticket holder must be 18 years of age or older on October 28, 2018 to win the raffle prize. 3. 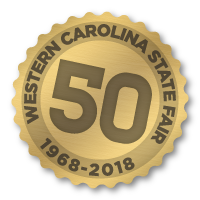 Raffle Tickets will be sold at a designated location inside the Western Carolina State Fair by the WCSFF beginning on October 19, 2018 up to Sunday, October 28, 2018 at 3:00 pm. Raffle tickets will be sold for $1.00 each. Raffle tickets will be sold at the Western Carolina State Fair at a location designated for that purpose. 4. The winning raffle ticket holder must be present inside the Western Carolina State Fair gates at the time of the drawing on Sunday, October 28, 2018 to win. If a winning ticket holder is not present or someone claiming the announced winning ticket within two (2) minutes of the ticket number being called, then selections will be made for other raffle tickets until a ticket is selected where the holder is (a) present at the WCSF at the time of the drawing on October 28, 2018, (b) meets the minimum age requirement of 18 years old, and (c) presents the winning ticket within the allotted time of two minutes after that ticket is called. 5. The winner is solely responsible for any and all taxes due on the award if any. 6. In the event of a dispute or controversy, the Western Carolina State Fair’s Raffle Chairperson and Committee will have final say by majority rule. 7. Acceptance of the winning raffle prize grants permission for WCSFF to use the names, pictures, video images, and relevant quotes of the winner in publications including the press and may be used for future fundraising. 1. The raffle winner is solely responsible for any and all taxes due on the raffle prize. The winner should consult his or her own tax accountant/advisor for any tax implications for acceptance of the raffle prize. 1. The Winning Ticket holder must be present at the Aiken County Fairgrounds at 4 p.m. on October 28, 2018, holding the winning raffle ticket when called at the official drawing. 2. The procedure for the calling of the winning raffle ticket will be as follows: A number will be called and the person with the winning number will have 2 minutes in which to claim the car. The winning number will be called at least 3 times during this 2-minute claim period. 3. At the end of the 2-minute claim period, a horn will blow, and the next number will be called. When the next number is called, the previous number is void. 4. This process will be repeated until a winner claims their car within the 2-minute claim period for their ticket number. 5. As indicated herein, if a winning ticket holder is not present or someone claiming the announced winning ticket within two (2) minutes of the ticket number being called, then selections will be made for other raffle tickets until a ticket is selected where the holder is (a) present at the WCSF at the time of the drawing on October 28, 2018, (b) meets the minimum age requirement of 18 years old, and (c) presents the winning ticket within the allotted time of two minutes after that ticket is called. 6. In the event of a dispute or controversy, the Raffle Chairperson and Committee will have final say by majority rule. 1. The raffle prize may not be substituted or exchanged. WCSFF may substitute a prize of equal or greater value should a featured prize become unavailable. For a raffle prize that is a motor vehicle, the winner may apply the cash equivalent of the prize won towards the purchase of an alternative vehicle of the same or higher fair market value from the same retailer. The winner is responsible for any and all costs beyond the cash equivalent of the prize, including all other costs, expenses, fees and taxes. 2. In the event of a dispute or controversy, the Raffle Chairperson and Committee will have final say by majority rule. 3. Raffle ticket holders, by participating (and winners, by accepting a prize) release WCSFF, and its respective parent companies, affiliates, partners, subsidiaries, agents, representatives, sponsors, service agencies and independent contractors, and each of their respective directors, officers, partners, employees and agents, including advertising and promotion agencies, from any and all liability with respect to participation in the raffle; the promotion; and possession, use, and distribution of the prize awarded. 4. WCSFF maintains no control of the personnel, equipment or operations of any supplier and assumes no responsibility for any financial loss, personal injury, property damage, other loss, accident, delay, inconvenience or irregularity which winners may experience by reason of (a) performance or nonperformance by any supplier; (b) wrongful, careless, negligent, or unauthorized acts or omissions on the part of any supplier or its employees, or on the part of any other party not under control of WCSFF; (c) any defect, breakdown or other failure of any aircraft, train, automobile, ship, accommodation, or other equipment or instrumentality owned, operated, or otherwise used by a supplier or; (d) any acts of God, acts or omissions of third parties, damage or loss associated with any terrorist activities, social, or labor unrest, mechanical or construction failures, disease, local laws, climactic conditions, or other conditions or developments. WCSFF shall not be liable for special or consequential damages arising from the use or ownership of any prizes. Participants hereby unconditionally release WCSFF from any such claims and all other claims whether known or unknown. 5. Proceeds from this raffle will be used to continue the mission of WCSFF.